The White Rogue Mink is an all purpose attractor. It is a serious fish taker. that is equally successful when fishing large lakes, small ponds and reservoirs. The pulsing movement of the "Mink" body plus the tantalizing movement of the marabou and flashabou tail simulate bait fish/fry. The benefits of using Mink fur is well worth the small extra expense to achieve a superb killing pattern. Body : Strip of white mink. 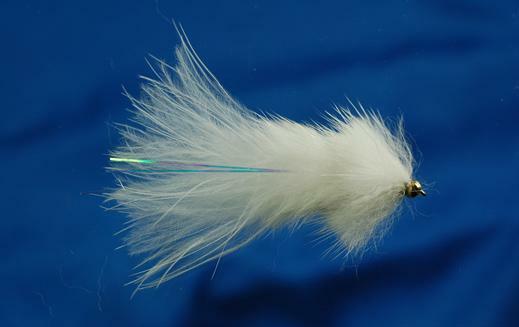 Tail : White marabou with 3 or 4 lengths of flat mylar/flashabou. Head : 2 mm bead, brass or tungsten. Currently there are no comments about the White Rogue Mink fly pattern from other fly fishermen yet.